you’re just two telling digits apart. their rinse cycle barbells your soufflés. street-parking out front on alternate months. who can you ever get to meet halfway? junk mail, lawn signs, offhand tools. the least you can do is offer the firemen coffee. Bill Howell has five poetry collections, including Porcupine Archery (Insomniac Press). Bill also has recent & upcoming work in Antigonish Review, ARC, Canadian Literature, Dalhousie Review, Descant, Grain, Prairie Fire, Vallum, and MESS: The Hospital Anthology (Tightrope Books). 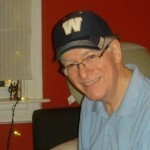 Originally from Halifax, Bill was a network CBC Radio Drama producer-director for three decades. Lately, he says, he's writing "Aural Treats for the Dyspepsia Generation."